Several months ago, I covered how to add two-factor authentication (2FA) to FreeRADIUS using Google Authenticator. Today, I will cover the TACACS+ version of it. I’ve written a blog post on how to build tac_plus server using Ubuntu. The guide was written in 2011, while it’s an old blog post, the instructions are still valid using Ubuntu Server 16.04. Please use that guide on how to build one, then use this guide to add multi-factor authentication (MFA) to TACACS+. It is super easy to install Google Authenticator on Ubuntu. 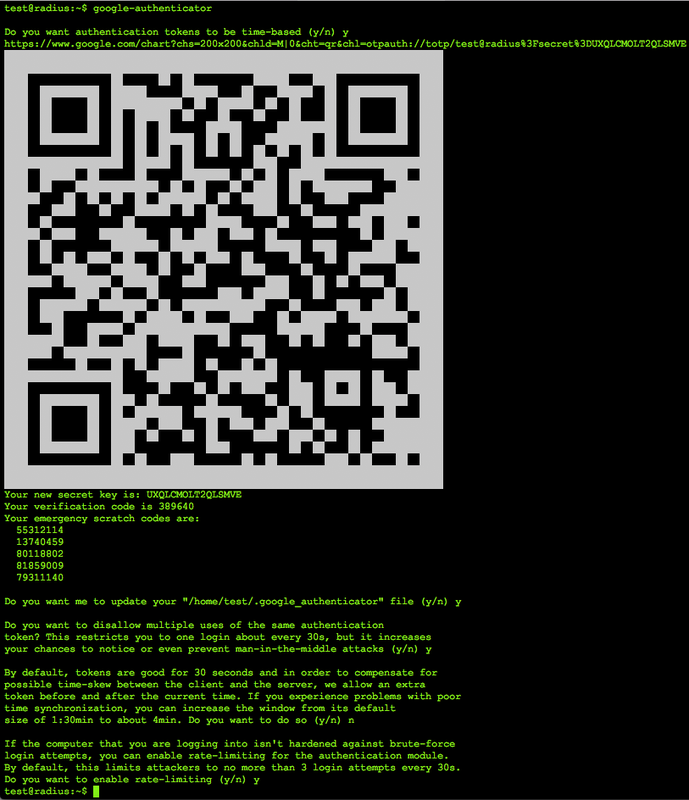 Below is the command we need to install Google Authenticator PAM on Ubuntu. As mentioned earlier, the instructions in my old blog post are still valid. We’re going to use only some of them in this post for the purpose of demonstration only. Since we made a change to our tac_plus config file, we need to restart the service for our changes to take effect. Issue the command below. [ ok ] Restarting tacacs_plus (via systemctl): tacacs_plus.service. An alternative command is shown below. This step is covered in my old blog post so head over there and skip to the generating the secret key section. Alternatively, we could use the same secret key(s) from another system with Google Authenticator. However, this is not the recommended practice. To get the secret key from another system, just copy and paste the $ ~/.google_authenticator file of each user, like the one below. If you copy and paste it to a file, make sure that the permission is set to read only. Before we can verify that our tac_plus config is working, let’s configure a CSR1000V router running IOS-XE. This CSR1000V router is using version 15.4(2)S image. The output may vary depending on what platform and the IOS version. For completeness sake, I will list the passwords entered in the example above. The tacacsuser account is a valid account on the Ubuntu server running TACACS+ daemon. For example, the tacacsuser account has a password of tacacsuserpassword1234. Next, the verification code is the six-digit number displayed on Google Authenticator app. For example, the six-digit number is 567 890. With this example, the user will enter tacacsuserpassword1234567890 in the password & verification prompt. For entering the privileged EXEC mode, we’ll again use tacacsuser’s password. If we look at the tac_plus config file, the enable = file /etc/passwd is what we defined. I am quite biased towards TACACS+. One of the reasons why is because of the command authorization piece. TACACS+ authentication and authorization are completely separate. That said, we could assign different command authorization level for the user or group. With RADIUS, it combines authentication and authorization. Once the user authenticates successfully, the access-accept packet sent by RADIUS server to the device contain authorization information as well. If we configure the device similar to the example here, then the user will have full access. To overcome RADIUS’ drawback, we could configure the device to use a local enable secret. This password is then shared only with the necessary user(s) or group(s). The issue with this approach is that the password is then a shared password. A lot of information security professionals do not like shared passwords because it is insecure. Having said all that, I think it’s better to use TACACS+, especially with the Cisco-centric environment. While a lot of vendors support TACACS+, there might be some limitations on the authorization piece. In my old blog post, I talked about how to mitigate from persistent SSH brute force attack. While there are several options in mitigating SSH brute force attack, I opted to use the Fail2Ban option at the time. Today, I’ve decided to add another security layer to the host since this is a public facing server. This addition of security layer is based on defense in depth, which is an information assurance concept. As the title says, I will be using Google Authenticator to generate a time-based one-time password (TOTP) for two-step verification. It seems like two-factor authentication (2FA) is becoming a norm these days. More and more security professionals are pushing organizations to use 2FA for every sensitive systems and application. Understandably so, because the consensus is that password is no longer enough to protect accounts in this day and age. As a result, I’ve also decided to start implementing 2FA in my home devices. Ubuntu has been my distro of choice for several years now, so all of my Linux-related tutorials have been on that. I will keep that going, mostly because I do not have time to learn another distro, like CentOS. Installing Google Authenticator on Ubuntu 16.04 is a piece of cake. All you need is one command. The Google Authenticator 2FA is accomplished by integrating into Linux’s Pluggable Authentication Modules (PAM) library. PAM is a way for programs to use an underlying authentication mechanism. With that said, we’ll need to configure PAM configuration to pass it to Google Authenticator. To do this, we need to edit the PAM configuration file for SSH. At the bottom of the file, I added the following lines below. The first line is optional, but it’s always best to add comment lines in my opinion. If you want to understand the syntax, please check this site. Though, the article did not include what nullok argument means. The argument simply means that if a user hasn’t created secret key yet, then they’re still allowed to log in. My recommendation is to enable 2FA for all users so make sure to have all the users generate the secret key. Once all secret keys are generated, take out the nullok argument. The next step is to actually configure SSH to check for backend system (e.g. PAM) to use the challenge-response authentication method. To do this, we need to edit the OpenSSH configuration file. Once the file is open, look for the line with ChallengeResponseAuthentication no and change it to yes. Save the file and exit. In Linux, changes to Linux configuration files require a service restart to take effect, for the most part. With that said, we need to restart SSH daemon (sshd). To restart SSH service, issue sudo service ssh restart command. Once sshd is back up, test to make sure that user can still log in without two-step verification. The last step to make SSH 2FA work is to generate a secret key for the two-step verification. In this example, I created a test user account for demo purposes. Use the Google Authenticator app on your mobile device and add the QR code. In this example, SSH daemon is asking the user to enter Google Authenticator OTP. Here the admin account does not have the Google Authenticator secret key yet. If one forgets to add the nullok argument, then the system will not allow user accounts without the secret key. It is probably a good idea to enable 2FA to the local login (console) too. So this way, anyone who has access to the physical machine will be subjected to two-step verification. To do this, we need to edit the login configuration file. Once the file is open, add the lines below at the end of the file. Save the file and exit out. From now on, all user accounts with Google Authenticator secret key will need to enter a verification code. Balancing security and convenience is one of the biggest dilemmas that information security professionals face. In a nutshell, making it convenient for users to access their account means it is less secure. In a perfect world (no bad guys) people would probably pick one password across all of their accounts. Since we’re not living in a perfect world, this leaves the accounts to be very insecure. If one account is compromised, then all of the other accounts could potentially be accessed by the bad guys. The use of complex passwords and password managers are good first steps toward securing accounts. However, in today’s world, some of the information security professionals view password alone as an antiquated technique in securing accounts. As a result, a lot of online services have had multi-factor authentication feature. However, companies that provide these online services do not force accounts to use it. As a result, accounts are still at risk by relying on passwords alone.